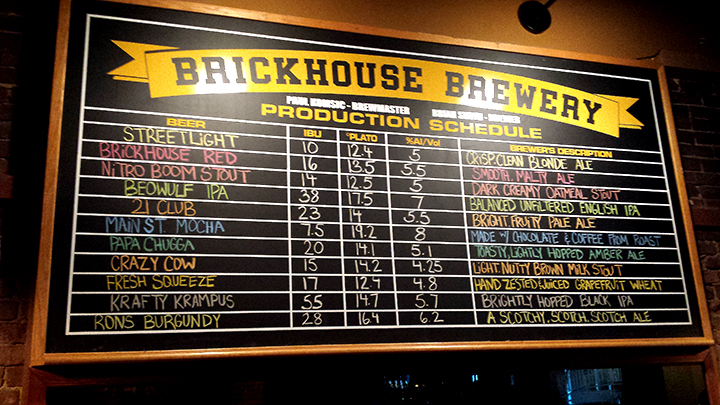 Paul Komsic – Brewmaster of BrickHouse Brewery. Walking past the BrickHouse Brewery, it’s easy to take for granted this soon-to-be 20-year old mainstay in Patchogue, New York. But if you take the time to look in the window, you might catch Paul Komsic, current brewmaster, walking among the copper and stainless steel tanks either bringing a new batch to a boil or checking up on a fermenting beer. “I have a quarter of a million dollars in brewing equipment in the front window and some people still believe it’s just for show,” says Paul. After years of honing his skills as assistant brewer to two former brewmasters, Paul took the reins as brewmaster in December of 2015. He is looking to expand on an already well-received beer line and add his own unique brewing vision to the history of BrickHouse. People are taking notice, but old perceptions are sometimes hard to shake. Ron’s Burgandy, Paul’s first original recipe, is a deep red “Scotchy-Scotch ale” with a bright American hop finish. Three kinds of rye are used to give this beer a spicy and malty backbone. Don Dapper IPA, Paul’s first professional IPA recipe. Think bold, fruity, juicy, and expensive. This IPA is made with Chinook, Wakatu, and Ella hops. Main Street Mocha, a porter brewed with coffee beans, from Roast Coffee & Tea Trading Company, and cocoa nibs. Crazy Cow, a brown milk stout with the bold taste of chocolate and roasted malts, with a hint of vanilla.